My dad introduced me to the majority of candies I have ever tried. One of his favorites which still exists today is Dots. First established in 1890 by Mason, they were all black licorice-flavored as Crows. In 1945, the original fruit-flavored Dots – which boast the title of most popular gumdrop in the world – debuted in small yellow boxes found in Tootsieâ€™s Fun Size mix. My dad had me sample both of these versions and I didnâ€™t care for either, not being a fan of black licorice and finding the fruit-flavored too sticky and stale. When I was a teenager, Tropical Dots debuted, which I bought not so much because I thought they would be any good, but rather because it was like seeing the first two installments of a bad horror film; you feel obligated to watch the next one so you’ll be able to claim to have seen them all. To my surprise, I actually loved the tropical version and it has since become a staple candy in my cabinets. 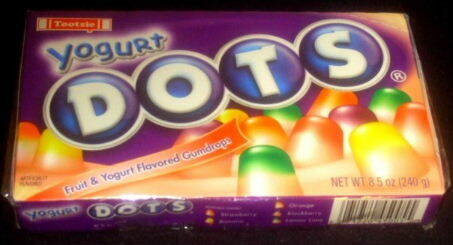 All these years later, I was shopping in a Walgreens in Los Angeles and a purple, movie-sized box of Yogurt Dots tempted me from the checkout line, and for only a dollar too. Having reasoned that Dots have progressively improved with each new version (black licorice = yuck, fruit = eh, tropical = yum), I was excited to taste the newest spinoff. 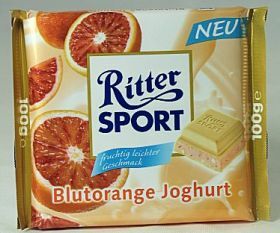 Here is another candy brought back from my friend traveling in Germany (Alpenliebe – Espresso Caramelle Colate was the first), this time it’s Ritter Sport Blutorange weisse Joghurt-Schokolade, which translates into Blood Orange with Yogurt Chocolate. I was a little tentative to try this, because well..how often do you get to try Blood Orange candy? Of course, I did try it, this wouldn’t be much of a review if I hadn’t. The package is resealable (are you listening Hershey? ), and contains 16 squares of the candy, which is layered with yogurt chocolate, pink blood orange filling and then more yogurt chocolate on top. These are actually pretty decent, tasting kind of like a more tart Creamsicle. The yogurt chocolate, which I’ve never heard of, tastes similar to white chocolate, but in my opinion better. I’m not sure if this is another name for white chocolate, and I couldn’t really find anything online, any readers know? There is also a small amount of rice crisps in these, and it’s also a low-fat candy. These are technically only available in Germany, but you can find some sites online to order from if you poke around. Here they are at GermanDeli.com.